This species, defined in 2006, comprises two former subspecies of Sceloporus magister, S. m. uniformis and S. m. transversus. 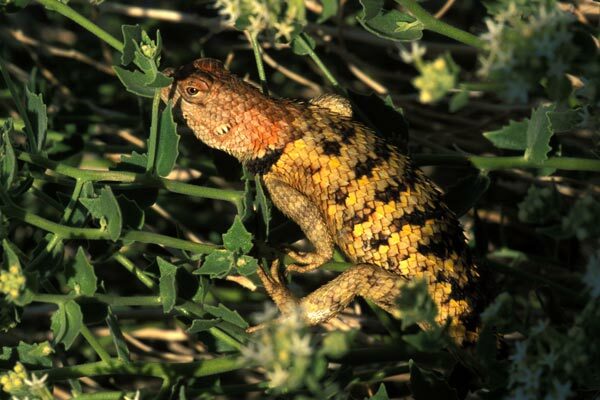 Since this change is so recent, most published material still calls these lizards Sceloporus magister. These lizards were common at the bottom of this trail. 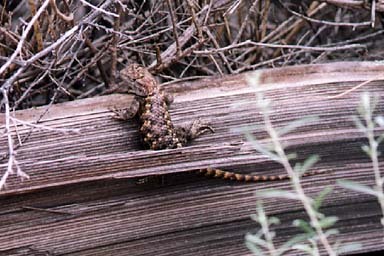 Nearly every log had its resident spiny lizard. This fellow here was keeper of the trailhead fence. I found this large and colorful spiny lizard perched in a flowering bush about three feet off the ground. The flimsy branches of the bush could barely support her weight as she munched on the flowers. The bright orange head is a mark of an adult female in breeding season. While driving across Nevada on "The Loneliest Road in America", Highway 50, we pulled off on the road to Sand Mountain to give our dogs a chance to get out of the car and, well, do those things that dogs do after getting out of the car. It was quite hot, and the dogs got back into the car almost immediately. I stayed a few minutes longer to take photos of the creepy Mormon crickets that were crawling and hopping around by the zillions. 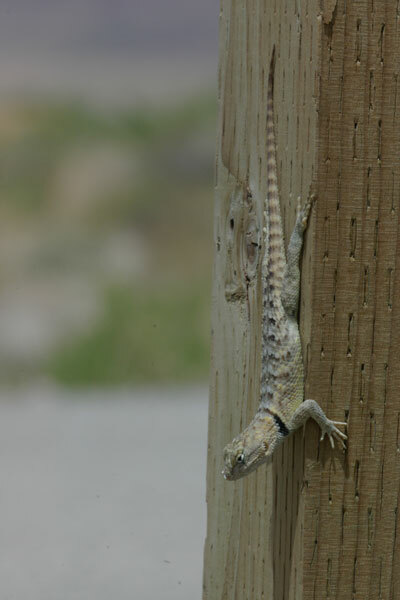 This young spiny lizard was keeping a careful eye on the Mormon crickets from the safety of a nearby signpost. It was probably dreaming of the day when it would be large enough to eat them. Alabama Hills is full of boulders. 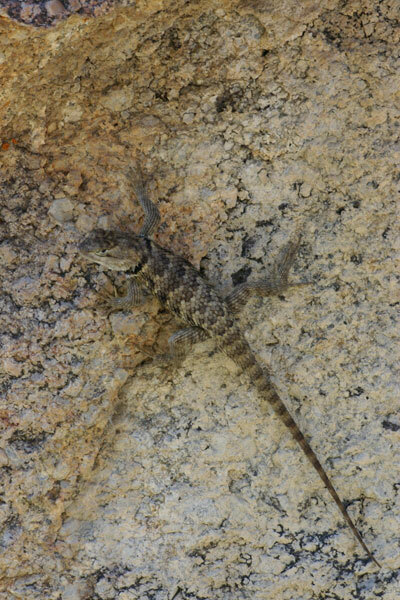 Alabama Hills is full of lizards. Alabama Hills is full of lizards on boulders.